WhatsApp's much-awaited and much-requested feature, Dark Mode, is reportedly still under development. WhatsApp is one app that needs no introduction in most parts of the world. It is the largest cross-platform messaging application that serves more than a billion people globally. While the developers are constantly working to improve the app by introducing new features, one of the most-requested features remains at large. With the growing adoption of OLED displays, the battery life of phones remains a rising concern. Recently at the 2018 Android Dev Summit, Google admitted that it pushed for use of white colour as primary on all apps and interfaces in its Material Design, but fixed the misstep by bringing Dark Mode to apps. While YouTube, Maps, Gboard and SMS all have the option to switch to dark mode, several third-party apps like Twitter and Truecaller also offer the battery-saving interface. WhatsApp has resisted offering Dark Mode in its app, despite many users requesting it quite often. 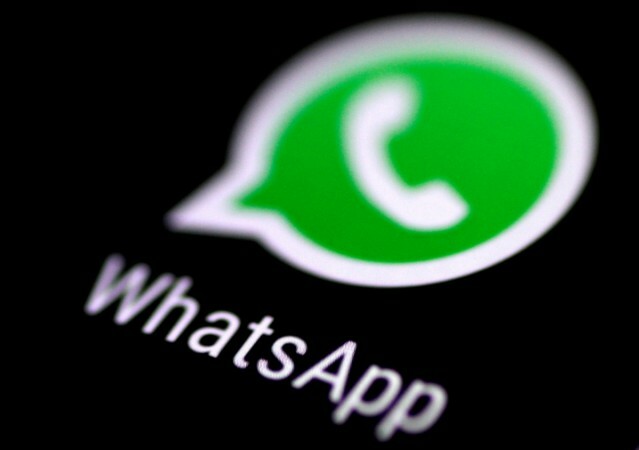 Rumours about WhatsApp Dark Mode have been making the rounds for a while now, but no one really knows when to expect the feature on Android and iOS versions of the app. 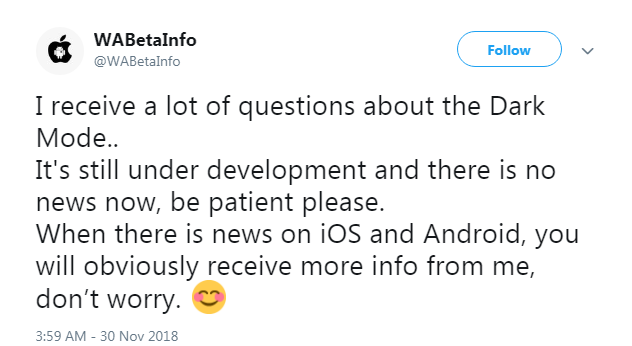 Noted WhatsApp tipster, WABetaInfo, recent tweeted responding to the pouring queries about WhatsApp Dark Mode, saying the feature is "still under development." This doesn't say that the lauded feature is coming anytime soon, but it sure suggests the arrival is imminent. WhatsApp is one of the heavily used apps on smartphones these days and with Dark Mode, users will be able to save a lot of battery. Not only that, it will be easy on eyes as the white and green colours across the app are straining in dim areas. WhatsApp Dark Mode must first arrive in beta before public rollout. The app is currently testing group voice calling feature with Android beta users in version 2.18.370. Upon successful completion of beta testing, the feature will be rolled out to all users over-the-air in a week or two.